Effect of floor cleaners on oxygen consumption and respiratory rate in carassius auratus. Pollution of the water bodies will create physiological stress on the aquatic fauna. Among various forms of pollution in water bodies, detergent pollution has an immediate and detrimental effect. The floor cleaners are household chemical cleaning compounds required in wide range for diverse purposes. In some rivers the concentrations of cleaning products is quite high. The major components of cleaning products such as Surfactants make adverse effects on the aquatic life at very low levels of exposure. Effect of floor cleaners on the consumption of dissolved oxygen by Carassius auratus were determined by using Winkler’s method. The floor cleaners used were Lizol, dettol and lemon grass oil. This study demonstrated that dissolved oxygen consumption in Carassius auratus increases in the presence of floor cleaners. This is due to the stress caused by the floor cleaners on the normal physiological activities of the fish. Effect of floor cleaners on the respiratory rate of Carassius auratus were determined by counting its gill movements. This study demonstrated that there will be changes in ventilation rates of Carassius auratus when dissolved oxygen levels change. Thus draining of domestic sewage containing detergents into water bodies adversely affect its aquatic fauna. The project is selected because of the higher pollution nowadays. The results of the project conducted shows that while adding detergent dissolved oxygen level started decreasing with higher concentrations. Results show that Lizol shows a higher range of decrease in the dissolved oxygen level in water with higher concentration. And lemon grass oil shows less effect compared to other two floor cleaners. So, it is better to use natural cleaners for floor cleaning purposes. Water bodies, Fauna, Pollution, Fertilizers, Pesticides. Water, like air, is one of the most important and precious natural resource and a regular and plentiful supply of clean water is essential for the survival and health of most living organisms. The state of Kerala in Indian Union is one among the rainiest areas in the world. Unfortunately, many of its water bodies are becoming increasingly murky, smelly and chocked with growth of algae. Most of the rivers have become darkened with chemicals, oils, sewage etc. Indiscriminate use and dumping of domestic sewage into fresh water resources has taken its toll on the various life forms of the aquatic habitat. A number of fish species that were abundant years ago have failed to cope up with the stress caused by increased concentrations of various chemicals that are poured into the water bodies. An indicator of pollution in water is its amount of Dissolved Oxygen (DO). Dissolved Oxygen’s presence in water is a positive sign, but low levels are a sign of severe pollution. Water with consistently high levels of DO is considered healthy and capable of supporting many different kinds of aquatic organisms. DO in water generally come from one of two sources. Most DO comes from the atmosphere and tumbling water mixes atmospheric oxygen. Another source of DO is photosynthesis by plants. Promiscuous use of pesticides and fertilizers has made these water bodies unsuitable for human use. Besides, many studies have reported the ill effects of fertilizers and pesticides on the fauna and flora of aquatic systems. However, apart from fertilizers and pesticides, another harmful chemical agent that often goes unnoticed is detergents. Pollutant acts as physiological stress or for exposed organisms as do the environmental parameters. Thus detergent stress apparently leads to higher metabolic rate which require an additional expenditure of energy. This increased energy demand perhaps interferes with the enzymatic systems of the metabolic pathway as well. Oxygen consumption is a measure of the metabolic state of the animal. Hence it is considered as vital parameters and indicates the physiological & metabolic alteration as the animal. It is known that the respiratory roles alter under the influence of a several biotic and abiotic factors. Surfactants are known to cause gill damage. Fish gills are well known to be a multifunctional tissue involved in not only respiration, but also osmoregulation. Gill damage is generally accepted as a cause of respiration difficulties and consequential death for many fishes. Nowadays, the major rivers and aquatic bodies of world were heavily polluted due to domestic, industrial discharge and detergents. A huge amount of various brands of detergent powders, flakes and various shampoos and toilet soaps. The surface-active property of detergents has been rendered them to be the most powerful cleaning agents. Because of this quality, are being used on a large scale for the past three to four decades. These detergents causes foam in the water bodies, reduce the air-water interaction leading to deficiency of oxygen to the aquatic animals under the water surface. The detergents and surfactants are non-degradable pollutant accumulated in water body. These detergents enter the food web through uptake by vegetation, planktons, fishes and zooplanktons. With the wide spread use of detergents for household cleaning purpose, it is inevitable that these compounds would find their way into rivers and ponds. Our study aims to understand the effect of various concentrations of detergents (floor cleaners) on Oxygen consumption of Carassius auratus. Population growth and industrial development are the major causes of contamination of water resources. In developing countries, pollution of water resources has become a serious problem which leads to ecological disorders and causes many physiological as well as biological changes in aquatic animals. The toxic components present in untreated wastewater discharged from textile industries affect the freshwater habitats. This textile wastewater is rich in BOD, COD and suspended solids. In addition, it is rich in starch, bicarbonates, chlorides and metals like copper and chromium which cause mortality as well as sub lethal stress affecting the growth of aquatic organisms. Detergents and other cleansing agents have been around for a quite long time. For generations, cleaning using detergents has been considered as a measure of hygiene. Bacteria are very diverse and present in soil, water, sewage and on human body and are of great importance with reference to health. A large number of chemical compounds have the ability to inhibit the growth and metabolism of microorganisms or kill them. The number of chemicals is enormous, probably at least 10,000 with 1,000 commonly used in hospitals and homes. Chemicals exist as solids, liquids and gases. Of the many groups of chemicals used to reduce or destroy microbes important groups include hydrogen, phenols, soaps, detergents, ammonia compounds, alcohols, heavy metals, acids and certain special compound. Disinfection, decontamination, antisepsis/sanitization and sterilization, just naming a few are terms that describe the process of cleaning by either soaps/ detergents or other cleaning agents. Numerous cleaning agents are available in the market, which are presented in various forms with distinct formulation. There are two kinds of detergents with different characteristics: phosphate detergents and surfactant detergents. Detergents that contain phosphates are highly caustic, and surfactant detergents are very toxic. The differences are that surfactant detergents are used to enhance the wetting, foaming, dispersing and emulsifying properties of detergents. Detergents can have poisonous effects in all types of aquatic life. Surfactants are a diverse group of chemicals that are designed to have cleaning or solubilisation properties. They generally consist of a polar head group (either charged or uncharged), which is well solvated in water, and a non-polar hydrocarbon tail, which is not easily dissolved in water. Hence, surfactants combine hydrophobic and hydrophilic properties in one molecule. Synthetic surfactants are economically important chemicals. They are widely used in household cleaning detergents, personal care products. Textiles, paints, polymers, pesticide formulations, pharmaceuticals, mining, Oil recovery and pulp and paper industries. The compositions of the sewage vary in space and time. Sewage contains human and animal excreta, food residues, cleaning agents, detergents and other wastes . The world production of synthetic surfactants amounts to 7.2 million tons annually . According to Lenntech, international company, situated nearby the technical university of Delft, the Netherlands, all detergents destroy the external mucus layers that protect the fish from bacteria and parasites; plus they can cause severe damage to the gills, Most fish will die when detergent concentrations approach 15 parts per million, Detergent concentrations as low as 5 ppm will kill fish eggs, Surfactant detergents are implicated in decreasing the breeding ability of aquatic organisms. Chandanshive stated that the detergent causes damage to the buccal lining and gill epithelium that may result in poor utilisation of food and interfere in oxygen uptake. It has affected the level of glycogen, protein and fat in fish. The detergent has also affected the behaviour of fish, oxygen consumption, biochemical content in tissue. All fish require oxygen for long-term survival; however, the physical properties of water make oxygen uptake a challenge even at high DO. Water holds approximately 1/30th the oxygen content of air at saturation, and oxygen diffuses about 10,000 times more slowly through water than air. Further, with wide spread use of synthetic detergents for household purpose, it is inevitable that these compounds would find their way into rivers and ponds, the effect of detergents on tissue of different fishes have been studied by Abel . Gills a primary site of osmoregulation, as well as respiration, may be highly vulnerable to lesions because they are in immediate contact with aquatic toxicants. The most prominent manifestation of the acute toxicological effect of detergents is on the gill tissue of the fish. Destruction of the gill epithelium is regarded as a consequence of the reduction of surface tension by the presence of surfactants . Detergent causes impairment of chemoreceptor organs  and damage to epidermis and pharyngeal wall . Eleven species of fish exposed to a mixture of hard alkyl benzene sulphonate based detergent under varying environmental conditions and during different stages of development have shown wide differences in response . Behavioural changes have been used successfully as rapid and sensitive indicators of toxic stress in fish . Fishes have a variable behavioural pattern which enable them to select environments favourable for survival and reproduction. These behavioural features provide useful measures of sublethal toxicity because they represent the integrated results of any biochemical and physiological processes. The respiratory movements are under physiological control of the respiratory centre and or modified by both internal (oxygen concentration, carbon dioxide concentration and pH) and external (temperature, oxygen depletion) factors. Increase in the rate of opercular movement in fish fingerlings in detergent exposed cases with decrease in dissolved oxygen, in above result clearly indicate the physiological stress to aquatic organisms. This stress leads to the accumulation of more lactic acid in gills along with increase in the activity of lactic acid dehydrogenase. Sprague, Dara and Mathew et al. has shown that muscular exertion in fish is accompanied by a marked increase in blood lactate. An increase in circulating catecholamines and plasmatic steroids due to stress in fish have been studied by Mazeaud. This increase in catecholamines may increase blood lactic acid level of fish directly. Exposure of fish to elevated level of surfactants cause multiple hepatomas to develop on the gill tissue resulting in diminished oxygen uptake and impairment of electrolyte balance [12-14]. To investigate the effect of detergents in dissolved oxygen consumption and respiratory rate in fishes, Carassius auratus is used for the study. Carassius auratus, Lysol, Dettol, Lemon grass oil, jars, 250 ml bottles, Manganous sulphate, Alakaline iodide, Sulphuric acid, Sodium thiosulphate, Starch solution, Burette, Conical flask, Measuring cylinders. Study fishes were collected. Young fishes averaging 10 g were selected. Water samples for the experiment were collected. 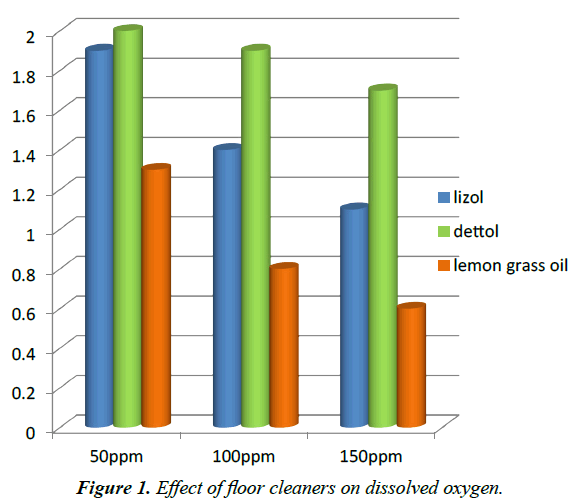 Three different concentrations (50 ppm, 100 ppm and 150 ppm) of the popular floor cleaners, Lysol, Dettol and Lemon grass oil was prepared in the sample waters of 1500 ml. Dissolved Oxygen (DO) content of the sample water was estimated using Winkler’s method. Transferred a fish each into three jars with the said concentrations of the floor cleaners and kept for 30 minutes. Similarly three control jars with 50 ppm, 100 ppm and 150 ppm floor cleaners were kept as controls. After 30 minutes, water samples were collected from the jars and estimated their DO content employing Winkler’s method. Difference between the amounts of DO in the sample with only floor cleaner and that with both floor cleaner and fish gave the amount of DO consumed by the fish for that particular concentration of floor cleaner. All experiments were repeated 3 times . Water sample for estimation after the experiment was taken in 250 mL bottles taking care to reduce the contact of this water to air and not to induce any air bubble in the sample bottle. The bottle was closed with a stopper. 1 mL of Manganous sulphate and 1 mL of Alkaline iodide were poured into the bottle using separate pipettes. Shook well and allowed to settle down. Shook the bottle again and 2 mL of concentrated Sulphuric acid was added to this mixture and shook vigorously to digest the precipitate. 20 mL of this solution was pipetted out into a conical flask. It was then titrated against Sodium thiosulphate solution taken in the burette until the brown colour of iodine almost disappeared. To this, added 3 drops of starch solution. The end point was marked by the first complete disappearance of blue colour. Transferred a fish each into three jars with the said concentrations of the floor cleaners and kept for 30 minutes. Similarly three control jars with 50 ppm, 100 ppm and 150 ppm floor cleaners were kept as controls. After 1 hour count the gill movements and find the respiratory rates. The experiment was conducted to study the effect of different concentrations of floor cleaners on dissolved oxygen consumption and respiratory rate in Carassius auratus. The floor cleaners used were Lizol, Dettol and Lemon grass oil of three different concentrations 50 ppm, 100 ppm and 150 ppm. The method used for study was Winklers method and respiratory rate was found out by counting gill movements. After 1 hour: As per the results shown in the table the samples treated with 50 ppm, 100 ppm, 150 ppm of lizol for a time period of 30 minutes, the dissolve oxygen content showed a decreasing trend ranging from 1.9 mg/1.5l, 1.4 mg/1.5l, 1.1 mg/1.5l. Detergents are composed of complex phosphates which eventually breakdown into phosphates usable by aquatic plants (Table 1). The use of detergents has been responsible for the increase in the phosphorous in sewage effluents. Phosphate pollution of rivers and lakes causes extensive growth of algae which depletes the dissolved oxygen content of water and disrupts the natural food chains. On treating the fishes with different concentrations of detergents they exhibited a state of inactive nature with an in increase in the rate of breathing with the secretion of mucous. Dissolved oxygen consumed by fish shows an increasing trend of 0.2 mg/1.5l, 0.4 mg/1.5l, 0.5 mg/1.5l. The average respiratory rate of Carassius auratus is 120 to 99 breaths per minute (Table 2). Here the results show that dissolved oxygen consumption by fish shows an increasing trend. In 50 ppm goldfish shows a respiratory rate of 187, it is more than its average respiratory rate. In 100 ppm and 150 ppm of lizol gold fish died within 30 minutes. Detergents are lethal to fish. These results show that detergents are highly toxic to fishes which may leads to it death with its exposure for a little while. Table 1. Oxygen Consumption of Carassius auratus exposed to various concentration of floor cleaner. Table 2. Respiratory rate of Carassius auratus exposed to various concentration of floor cleaner. After 1 hour: As per the results shown in the table the samples treated with 50 ppm, 100 ppm, 150 ppm of dettol for a time period of 30 minutes, the dissolve oxygen content showed a decreasing trend ranging from 2 mg/1.5l, 1.9 mg/1.5l, 1.7 mg/1.5l. Detergents are composed of complex phosphates which eventually breakdown into phosphates usable by aquatic plants. The use of detergents has been responsible for the increase in the phosphorous in sewage effluents (Table 3). Phosphate pollution of rivers and lakes causes extensive growth of algae which depletes the dissolved oxygen content of water and disrupts the natural food chains. On treating the fishes with different concentrations of detergents they exhibited a state of inactive nature with an in increase in the rate of breathing with the secretion of mucous. Dissolved oxygen consumed by fish shows an increasing trend of 0.1 mg/1.5l, 0.2 mg/1.5l, 0.3 mg/1.5l. The average respiratory rate of Carassius auratus is 120 to 99 breaths per minute. Here the results show that dissolved oxygen consumption by fish shows an increasing trend. In 50 ppm goldfish shows a respiratory rate of 166 and in 100 ppm it is 175 and in 150 ppm gold fish died. Detergents are lethal to fish (Table 4). These results show that detergents are highly toxic to fishes which may leads to it death with its exposure for a little while. Table 3. Oxygen Consumption of Carassius auratus exposed to various concentration of floor cleaner. Table 4. Respiratory rate of Carassius auratus exposed to various concentration of floor cleaner. After 1 hour: As per the results shown in the table the samples treated with 50 ppm, 100 ppm, 150 ppm of lemon grass oil for a time period of 30 minutes, the dissolve oxygen content showed a decreasing trend ranging from 1.3 mg/1.5l, 0.8 mg/1.5l, 0.6 mg/1.5l. Detergents are composed of complex phosphates which eventually breakdown into phosphates usable by aquatic plants (Table 5). The use of detergents has been responsible for the increase in the phosphorous in sewage effluents. Phosphate pollution of rivers and lakes causes extensive growth of algae which depletes the dissolved oxygen content of water and disrupts the natural food chains. On treating the fishes with different concentrations of detergents they exhibited a state of inactive nature with an in increase in the rate of breathing with the secretion of mucous. Dissolved oxygen consumed by fish shows an increasing trend of 0.1 mg/1.5l, 0.3 mg/1.5l, 0.4 mg/1.5l. The average respiratory rate of Carassius auratus is 120 to 99 breaths per minute. Here the results show that dissolved oxygen consumption by fish shows an increasing trend. In 50 ppm goldfish shows a respiratory rate of 100 and in 100 ppm it is 150 and in 150 ppm fish died. Detergents are lethal to fish (Table 6). These results show that detergents are highly toxic to fishes which may leads to it death with its exposure for a little while. Table 5. 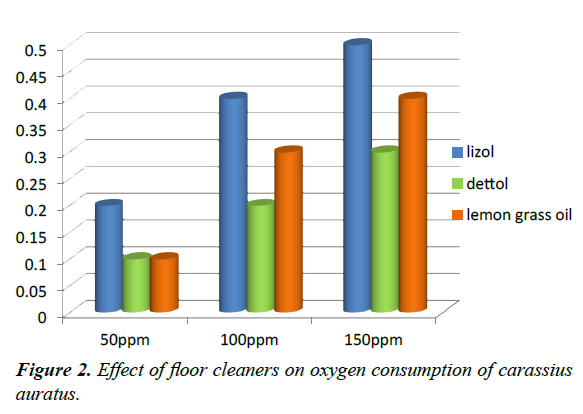 Oxygen Consumption of Carassius auratus exposed to various concentration of floor cleaner. Table 6. Respiratory rate of Carassius auratus exposed to various concentration of floor cleaner. Detergents and other cleansing agents have been around for a quite long time. For generations, cleaning using detergents has been considered as a measure of hygiene. Bacteria are very diverse and present in soil, water, sewage and on human body and are of great importance with reference to health. A large number of chemical compounds have the ability to inhibit the growth and metabolism of microorganisms or kill them. There are numerous types of cleaning products available nowadays. They are effective in cleaning purposes but they are highly toxic to lower organisms (Figure 1). Figure 1. Effect of floor cleaners on dissolved oxygen. In the present project conducted on Carassius auratus using three different concentrations (50 ppm, 100 ppm, 150 ppm) of three commonly using floor cleaners (lizol, Dettol, lemon grass oil), lizol is more toxic to experimental fish as it died after 1 hour exposure with two out of three concentrations (Figure 2). In case of detol and lemon grass oil, experimental fish died in one out of three concentrations. Concentration of 150 ppm is highly toxic to experimental fish as it died all three times with these three floor cleaners. Gill damage is generally accepted as a cause of respiration difficulties and consequential death for many fishes (Figure 3). So here also gill damage due to the effect of detergents is the main reason for the death of the fish. Dissolved Oxygen’s presence in water is a positive sign, but low levels are a sign of severe pollution. Water with consistently high levels of DO is considered healthy and capable of supporting many different kinds of aquatic organisms. The results of the project conducted shows that while adding detergent dissolved oxygen level started decreasing with higher concentrations. Lizol shows a higher range of decrease in the dissolved oxygen level in water with higher concentration. Figure 2. Effect of floor cleaners on oxygen consumption of carassius auratus. Figure 3. Comparison of effect of floor cleaners on respiratory rate of carassius auratus. The chances of finding a higher concentration of microorganisms are high on floors as they are exposed. For the effective removal of these microorganisms various floor cleaners are used. The microorganisms that are present on the floor surface are killed when they are exposed to these floor cleaners. The action of floor cleaners against these microorganisms is due to some ingredients like Chloroxylenol, Triclosan, benzalkonium chloride etc. The most recent studies revealed that Triclosan cause cancer and it also leads to impairment of cardiac and muscles of the skelton. Over the years, cleaning agents have played an important role in the control of microbes. Some commonly used cleaning agents like Lisol, Dettol, Chandrika, were effective floor cleaners, but they seriously harm aquatic life. Major ingredients of Lisol are: Benzalkonium chloride solution, Tartrazine yellow, Alizarincyanin green F ionic and non-ionic surfactants, perfumes, preservatives and water. Surfactants are highly toxic to aqauatic life. It has high cleaning properties but it harms aquatic organisms. The active ingredient in Dettol that confers its antiseptic property is Chloroxylenol, an aromatic chemical compound. It also includes terpinol, alcohol absolute, caramel as colouring agent. It is not significantly toxic to humans and other mammals, is practically non -toxic to birds, moderately toxic to freshwater invertebrates and highly toxic to fish. The cleaning effect of Dettol is minimal. Excessive amount of water is needed for it. The ingredients of lemon grass oil include Myrcene, Citronellal, Geranyl Acetate, Nerol, Geraniol, Neral, Limonene and Citral. Among which geraniol and myrcene are highly toxic to fishes. They will cause fish mortality. The study on effect of three commercially available cleaning agents i.e., lizol, dettol and lemon grass oil on dissolved oxygen consumption and respiratory rate in Carassius auratus shows that lizol is more toxic to experimental fish (Carassius auratus). As in the case of lizol the experimental fish in two out of three concentration dead within one hour. And also the decreasing trend of dissolved oxygen is highly shown in case of lizol than other two (Dettol and lemon grass oil). From the study it was evident that the higher concentrations of floor cleaner in water will lead to the decrease in dissolved oxygen and also leads to higher respiratory rate than the average of 120 to 99 breaths per minutes. At the higher concentrations of 150 ppm the experimental fish in all the samples with these three types of floor cleaners were dead. Anantha Krishnan, Soman MK. The onset of the southwest monsoon over Kerala:1901-1980. J climatol. 1988;8:283-96. Di Corcia A. Characterization of surfactants and their biointermediates by liquid chromatographymass spectrometry. Journal of Chromatography. 1998;794:165-85. Abel PD. Toxicity of synthetic detergents to fish and aquatic invertebrates. J Fish Biol. 1974;6:279-98. Bock KJ. Uber die wirk~ng yon waschrostoffena~ffische. Arch Fischwiss. 1965;17;68-77. Brown VM, Mitovie VV, Stark GTC. Effect of chronic exposure to Zn on toxicity of mixture of detergents and Zn. Water Res. 1968;2:255-63. Bromage NR, Fuchs A. A histological study of the response of the internal cells of the gold fish (Carassiusauratus) to treatment with sodium lauryl sulphate. J Fish Biol. 1976;2:529-35. Bardach JE, Fugiya M, Hall A. Detergents effects on the chemical senses of the fish Ictalurusnatalis (lesueur). Science. 1965;148:1605-07. Thatcher TO. The comparative lethal toxicity of a mixture of hard ABS detergent products to eleven species of fishes. Int J Air Water Pollut. 1966;10(9):585-90. Sprague JB, Elson PF, Saunders RL. Sublethal copper-Zinc pollution in a salmon river-a field and laboratory study. Int J Air Water Poll. 1965;9:531-43. Dara SS. A textbook of environmental chemistry and pollution. New Delhi: S. Chand and Co. Ltd; 1993. Emi Mathew, Sunitha PT, Philip Litto Thomas. Effect of different concentration of detergent (Surf) on dissolved oxygen consumption in Anabas testudineus, IOSR. Journal of environmental science, toxicology and food technology (IOSR-JESTFT). 2013;5(3):01-03. Misra V, Lal H, Chawla G, Viswanathan PN. Pathological changes in gills of fish fingerlings (Cirrhinamrigala) by linear alkyl benzene sulphonate. Ecotoxicol Environ Saf. 1985;10:302-08. Zaccone GP, Lo Casico S, Fasulo A Licata. The effect of an anionic detergent on complex carbohydrates and enzyme activities in the epidermis of the catfish. Histochemical J. 1985;17:453-66. Chandanshive NE, SM Kamble. Acute toxicity of Surf excel and Nirma to freshwater fish Garramullya (Skyes). J Aquatic Biology. 2006;21(3):53-7. Chandanshive NE. Studies on toxicity of detergents to Mystusmontanus and change in behaviour of fish. Res J Animal, Veterinary and Fishery Sci. 2013;1(9):14-19.